As Amazon Web Services (s amzn) adds more features to its cloud platform, the anxiety among competitors — as well as partners — grows. Can anybody, including the evolving OpenStack crowd, Microsoft (s msft) Windows Azure, or other potential rivals, hope to compete? The latest news that Amazon will let Eucalyptus use the AWS API to connect Eucalyptus-based private clouds with Amazon’s public cloud gives AWS a better story for companies that prefer a hybrid cloud solution for security and other reasons. And, it gives Eucalyptus, which faces an uphill battle against OpenStack, some credibility. But perhaps most important, it establishes that AWS — and its API — is the de facto standard defining cloud computing. … what is really interesting about the Eucalyptus announcement is that it lends credibility to AWS as the definition of cloud computing (not just the market leader or early adopter). Using AWS as the definition and getting rid of all of the IaaS/PaaS crap makes it pretty easy for AWS to talk to the enterprise – far more than talking on-prem [on premises] does. Because of that API support, developers working on Eucalyptus-based private clouds can use the same AWS tools — their Amazon Machine Images (AMIs) and scripts — to manage both the Amazon public cloud and their private, on-premises clouds. Amazon and its AWS API rule the roost in cloud with hardly a No. 2 player in sight. That is something the OpenStacks and Windows Azures of the world must face going forward. But there are still more developments that worry third-party partners. This week Amazon beefed up its CloudFront content delivery network (CDN) capabilities so that it will be more applicable for quickly changing, as opposed to static, content. CDNs speed up web performance by putting content closer to its likely users to speed page views and downloads. This is “a pretty clear shot at the CDN players” out there, said one Amazon watcher. Amazon uses third-party CDNs but has also offered its own CloudFront service for some time. CDN companies are keeping an eye on this, although they say — privately — that what AWS offers is fairly rudimentary. 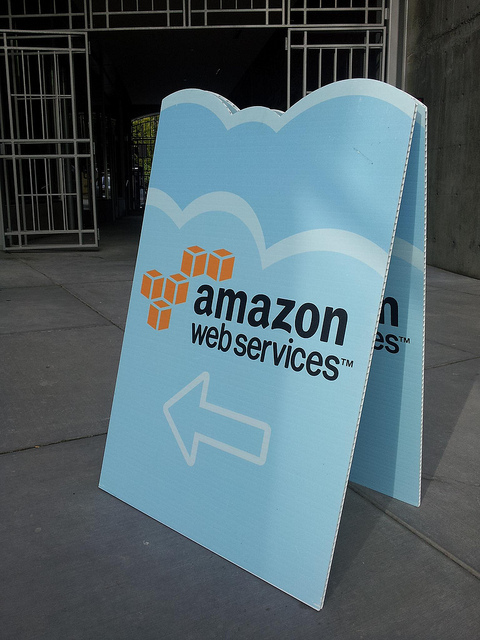 “Is this a sign that Amazon will get more into CDNs for dynamic content delivery? Probably,” said one executive with a CDN player. This week AWS also announced enhancements to its Elastic Beanstalk platform-as-a-service, which now supports the popular PHP programming language and Git version control system. An Amazon spokeswoman said that the new services are offered to meet customer demand. “CloudFront is a fast growing CDN and one that provides an option for customers who don’t want to negotiate standard CDN contracts. We listen to our customers and customers have asked us to build this type of functionality into the service so that’s what we’ve done,” she said via email. As for Elastic Beanstalk enhancements, the spokeswoman said the company always said pledged support for multiple development stacks and languages. One of the most important AWS principles is flexibility. Flexibility is in the choice of software and languages running on AWS, in the tools and interfaces available to manipulate resources and applications, and in the ability to leverage services from other providers. Vogels also promised to work closely with current and future platform partners and use their feedback to develop new featuers and services that will help them. Indeed, startup companies trying to build new services often consult with Amazon to make sure what they’re doing will not conflict with planned AWS services. This partner concern is not new. As I’ve reported before, it crops up repeatedly as Amazon adds new services. While it’s natural for AWS to expand offerings to customers, some of those customers happen to be PaaS providers that provide the very sort of services that Amazon wants to add. In many ways AWS now is much like the Microsoft of 10 or 20 years ago — as it added capabilities to Windows and Office, it displaced third-party software companies that had filled those gaps. Microsoft built its own prodigious presence by doing so, but also thinned out its own ecosystem. AWS appears to be on the same track. This is not tactical, it is strategic. First there was Storage Gateway, than Simple Workflow Services, now Eucalyptus AWS API partnership. Combined that with unprecedented enterprise engineer hiring spree during the last 2-3 months and you can start seeing an emerging enterprise ecosystem. Yes, some partners may freak out, but, that is a small price to pay for the new opportunities for Amazon. Amazon is still it its infancy around partnerships and the larger IT market. HP, Microsoft, IBM, SAP, et al have had a channel for DECADES. Amazon is 3-4 years into figuring out how all this works and they’ve made a habit out of reinventing the wheel every step of the way. They know partners are key to continuing growth, they just don’t have it down to a science yet. One of the differences between Amazon and Microsoft is that Microsoft expanded its offerings by many acquisitions of startups (http://bit.ly/GM6MCb) while AWS is developing everything in-house. That means that startups (and their investors) don’t view Amazon as an exit path and are reluctant to (exclusively) support AWS. There are many industry forces who have a vested interest in investing in OpenStack (almost everyone except for Amazon) and they will push it as an alternative platform. As long as AWS continues its growth on the customer side, it should be able to handle the demands of partners as well. Amazon is currently the clear leader, but tech has a tendency to favor the underdog.